On 18-19 June 2011, the committee ?Buddhism and Society? 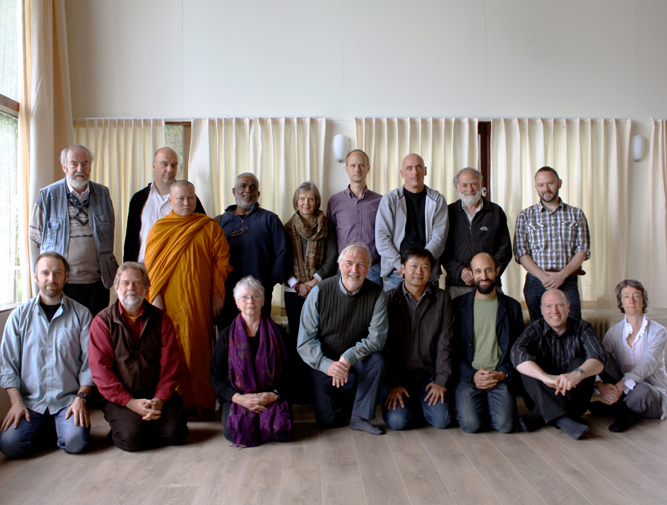 of the European Buddhist Union organised an informal networking weekend, hosted by the Naropa Institute in Cadzand, the Netherlands. Socially engaged Buddhist networks from the United States, Asia and Europe were represented. Over 2600 years ago, Siddhartha Gautama rejected all forms of social discrimination and institutionalized inequalities. Buddhism teaches that everyone, regardless of race, colour, gender, sexual orientation, language, religion, political ideology, nationality, social origins, property, birth status or other distinctions, has the potential to become enlightened. The global financial crisis reminds us that social and economic structures are fashioned by human minds, which also implies that they can be reconstructed. No-self, impermanence and interconnectedness are inspirational core teachings that help us (with meditation and other contemplative practices) to identify suffering and the causes of suffering, and to act compassionately, with awareness of our own motivations. Becoming aware of the suffering due to abuse, injury, poverty, illness, imprisonment, oppression and war continues to be a source of action for many Buddhists. Many types of initiatives have been developed in different parts of the world. 1. Many socially engaged projects by Buddhists are not well known within the broader Buddhist community. The participants identified a strong need to share ideas and methods. It would therefore be useful to set up a directory and network, a sort of World Forum for Socially Engaged Buddhism, to facilitate global communication and cooperation. The participants intend to support informal networks via mailing groups and the construction of a website where existing initiatives, ideas and literature are easily accessible. 2. As a first step it would be useful to organize a European symposium on Socially Engaged Buddhism in the near future (Summer 2013). This will be the third in a series of major conferences on the topic, following a symposium on engaged Buddhism in the United States (August 2010 in Montague, Massachusetts) and a forthcoming conference on ?The Future of Buddhism: from Personal Awakening to Global Transformation? by the International Network of Engaged Buddhists (INEB) in India (October 26-29, 2011 in Bodh Gaya). The proposed European symposium will highlight the activities of those who are already involved in engaged Buddhist initiatives and encourage cooperation among them. It will also bring together people who would like to do something and put them into contact with those who are already conducting projects. 3. Finally, we participants at the networking weekend in Cadzand invite all Buddhist organizations to reflect on existing or potential initiatives within their own communities. National Buddhist Unions in Europe might also consider appointing a national coordinator to gather information on local projects within their countries, and to forward that information to the international network. It is important that individual Buddhists and Buddhist organizations take a much more active role in responding to the ecological and social challenges that threaten our planet and its inhabitants. Our situation is urgent and time is running out. 4. We also welcome the various kinds of support you might be able to offer: sharing ideas, informing us about socially engaged projects, promoting such projects, administrative support, help with the construction and maintenance of a website, links to existing websites and social networking communities, etc. May you who read this letter be free from suffering and the causes of suffering. May everyone you meet be free from suffering and the causes of suffering.